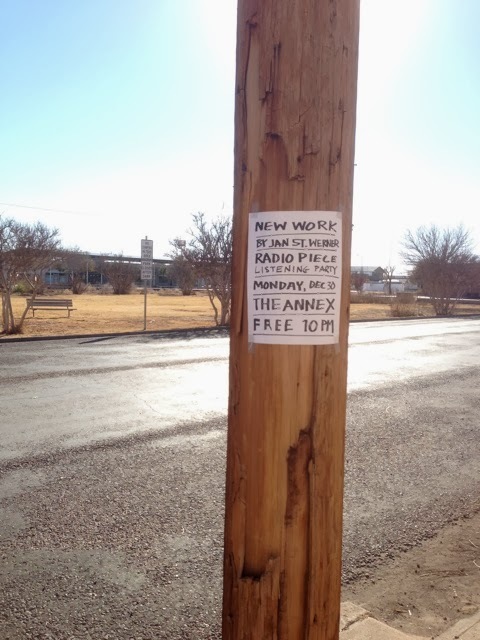 “The piece is 36 minutes in length and draws into itself a diverse range of sounds that Jan St. Werner has recorded during his stay in Marfa along with elements recorded elsewhere but which reasserted themselves in this place. The piece manages to be site specific, but without being orthodoxly so. The train is a representative element in that it contributes a significant aspect to the town, and to the piece, because it omes from elsewhere, appears and then returns to farther away. “So did the poet Clark Coolidge appear; and musicians Primo Carrasco, Max and John Ferguson, Scott Hawkins and David Grubbs; so, too, the various anonymous visitors to the Marfa Lights’ Viewing Station and linguist Lynette Melnar; and almost everyone, including Jan and myself. Additionally, Jan has treated the radio event as a sculptural entity, one that can be cut from time and transferred, via recording to other times and places.